The author of this small plan of London invites his readers to find their way around the city, from the Strand to St. Paul's, avoiding the many roads closed for repair. 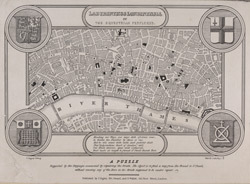 The plan's title appears at the top, with the royal Arms at the top left, the city arms at the top right, the arms of Bridge House at the bottom right and the arms of Westminster at the bottom left. A note explains the rules of the puzzle in the panel below the plan.